November 2012 – He Said What?! Last night I walked into Aaron’s room to say goodnight because, as some of you may remember from previous blogs, Aaron much prefers that I say goodnight to him IN his room……….not in the hall, not in our bedroom, not in the bathroom as he brushes his teeth……….but IN his room. Some of the fastest walking that you’ll see Aaron do is when he’s ready to say goodnight and is afraid that I’ll attempt to do that outside of his room. He walks at a fast clip down the hall so that he can get IN his room and then turn to say goodnight. Ah, the mysteries of autism! So this was the problem…….this was why he was pensive and quiet. As we have watched him develop a special friendship with Rosie, we have tried to discourage romantic feelings while we instead encourage the friendship side of their relationship. Rosie’s mother agrees. Romance, in whatever form that might take with Aaron and Rosie, is fraught with concerns. As I sat there wondering where this conversation would lead, he continued by telling me of an incident where someone at Paradigm had told him that he doesn’t have a girlfriend. Aaron is struggling with this notion of not having a girlfriend, and of wondering where Rosie fits into this situation. I urged him last night to be thankful for the wonderful friendship that he and Rosie have………that she doesn’t have to be called his girlfriend for them to be close friends……..that nothing anyone says can change the special bond that he and Rosie have. Why did I, once again but more now than ever, feel trapped? Why was I feeling guilty that my friendship with Gary went into this boyfriend/girlfriend realm? Was it because now Aaron was figuring out my hypocrisy? I could tell him to remain friends with Rosie but Dad and I didn’t do the same? I wanted to say, “What WHAT is??! !” But I calmly said yes, that’s what it is. Dad and I fell in love. Oh, Aaron. I repeated that no, she doesn’t need to be called his girlfriend in order for them to be good and special friends. He said OK and thumped back up the hall to his room, closed his door, and ended the conversation. But I know it’s not the end of this issue. Aaron is thinking and his heart is confused. He’s a 28 year old man with the thoughts of a confused adolescent. We would not deny Aaron any happiness in the world that was of no harm to him. 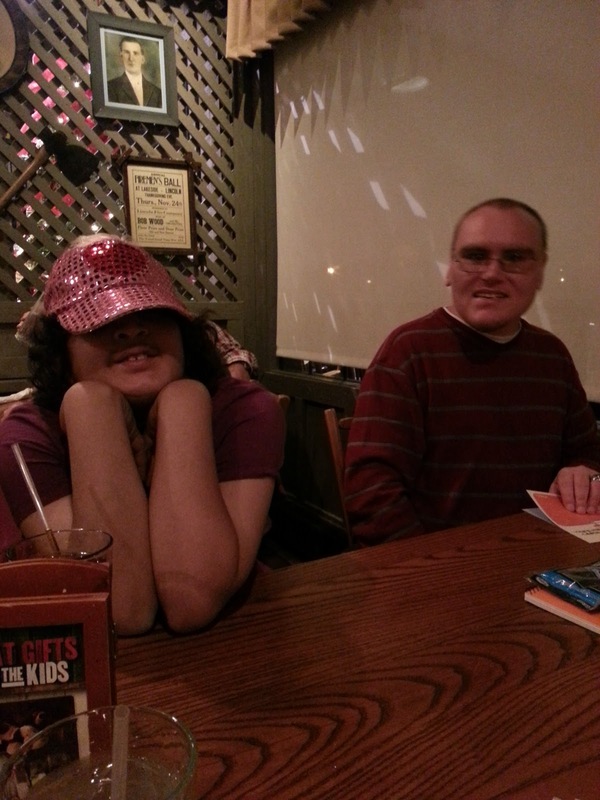 Yet this issue of love is tricky ground for our special needs children……..our children who are actually adults. I have to give it to him…………he is putting two and two together, and realizing that for Dad and I it equaled four………so why can’t it equal four for him and Rosie, also? And while we don’t mind if Aaron and Rosie are called boyfriend and girlfriend, we know what the next natural step is and we can’t even go there in our minds. Marriage may be the farthest thing from Aaron’s mind, but at one time so was the thought of having a girlfriend. Aaron feels……..deeply. Aaron thinks…..also deeply. And we all know that Aaron talks……a lot. I know that he will talk about this subject again, and I know that Gary and I will need wisdom to say the right things and to not brush away his feelings and his longings. Maybe the next time he brings it up, I’ll give him the best answer I can think of…….go talk to your dad!! I love that time when all the Christmas decorating is finally done. The boxes that now contain our everyday items are stacked safely back in the storage room; the floors have been vacuumed free of all the stray glitter and the small strands of green that have fallen from the garland and the tree; and the extension cords are full of the extra plug-ins that allow the Christmas village and the Christmas greenery to beautifully twinkle. There in the center of it all, commanding the most attention, is our Christmas tree. 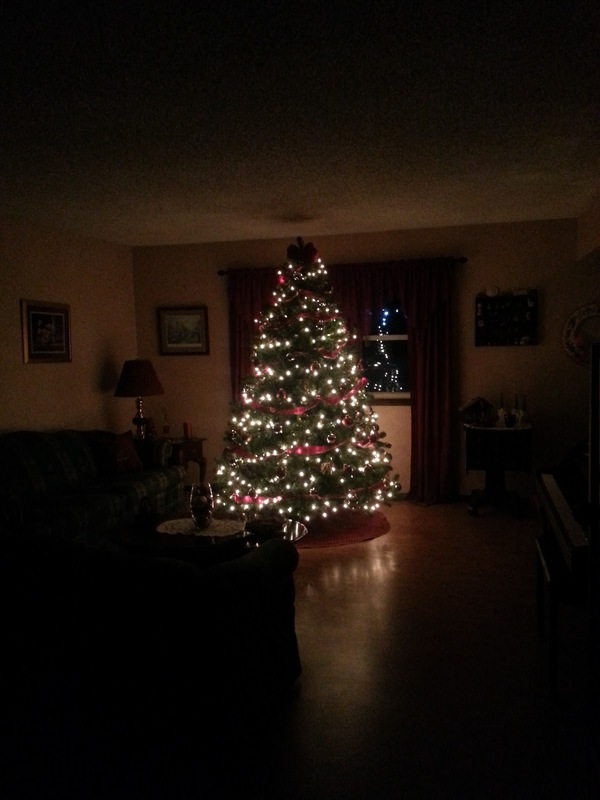 I enjoy sitting on the couch in the living room whenever I can, taking in the sight of our tree and basking in the warmth that it helps to create in my heart. I had always wanted a large, full Christmas tree. Finally, several years ago, I found the tree……….THE tree that I had always wanted. It was on sale, so the price was right. Our other tree was literally falling apart after years of use, so the timing was right. I bought the tree and for these several years we have fully delighted in its beauty. Yet as I sit near this lovely tree, I am taken back in my memory to another tree………..another time. The year was 1979. Gary and I had gotten married that year and were preparing to spend our first married Christmas together. I had graduated the year before from Piedmont Bible College. Gary was still a student there, finishing up his degree in Theology. We lived in a little house not far from campus, and like most students we scrimped in order to make ends meet. Our house was full of hand-me-downs from family……….bedding, curtains, furniture. We had some new items from wedding showers and gifts, but back then there were no gift registries and certainly very few young couples with houses full of the best and the finest. Gary had made us a simple stereo stand out of cement blocks that we had painted, and we would enjoy our records and our 8-tracks and cassettes in the living room as we sat on our second-hand furniture. Life was sweet and we were very blessed. Gary worked several jobs in order to provide for us in the midst of attending classes. I worked full-time in the school library, and took a class or two on the side. I remember how we budgeted $25.00 a week for groceries………..how excited I was when Gary’s mother gave us lots of venison and taught me how to cook it……..and the pumpkins that she brought us and helped me to prepare and freeze. I remember going to see my parents and how touched my Mom was when she heard Gary say, as he looked at her roast, “Look! There’s beef and it’s not ground!” We all laughed, and of course Gary and I were given the leftover roast to take back to our little house in North Carolina. I remember the time that my cart of groceries was stolen in front of the grocery store as I went to get my car, and how devastated I was……….and how the manager of the store let me take my receipt and get the same groceries at no charge. God always provided! On our first Christmas I knew that we could not afford a real tree………or any tree, for that matter. I didn’t make it a big deal, but in my heart I was a little sad. I took out a small oval wooden stool, and on it I placed the tiny artificial tree that my college roommate and I had shared during our dorm years. It really was comical to see our little Charlie Brown tree perched in our living room, hardly noticeable as it attempted to adorn our room. Any gifts that would be placed around it would soon dwarf this miniature tree. We laughed and we determined to treat this tree as special as if it was huge and ornately decorated. We were young and we were in love, relishing our first Christmas together as husband and wife. Yet Gary knew my heart and he knew that a tree, a real tree…..and a taller tree…….would thrill his new wife. One day I came home from work and routinely began to hang up my coat and think about preparing some supper. I stepped into the living room in the dusk of evening and something caught my eye. I could not believe what I saw! There, perched in the corner, was a Christmas tree! A real, live, honest-to-goodness Christmas tree! I gasped and then ran to Gary, hugging him and thanking him as he smiled in delight. I didn’t know how he did it, but I did know that this tree was going to be beautiful. I wish I had a picture of it now. I would probably smile if I saw it. I don’t remember how we decorated it, but I’m sure it was fairly sparse and simple. Yet to me this tree, in my heart, has always been our most special tree………..my favorite tree for sure. Not because it was huge and full……… not because it was gorgeously decked out with beautiful matching ornaments……….not because there were tons of gifts underneath. None of those things was true about this tree. This tree was special because it showed the heart of my husband and it demonstrated his love for me. Despite his class schedule and all of his demanding work hours, and regardless of our lack of money, Gary somehow managed to buy me the tree that he knew would make my eyes shine brighter than any lights or ornaments ever could. I think of that simple tree every time we pull out our Christmas tree and get it all beautifully decorated. I think of the love that it symbolized and the sacrifice it embodied. I’m thankful for thirty-three years of marriage to this man who quietly goes about showing me, and showing our children, how much he loves us. We’ve gone through a lot of Christmas trees in those years, but none holds as dear a place in my heart as that first special tree. Well my goodness, Aaron. What is it? That morning I had stopped with him at Dillons on our way to his group. He had wanted some peanuts – normal nuts, as he calls them – and so the first thing that he pulled out of his bag was the jar of peanuts………..only half eaten. He was quite proud of this accomplishment since normally he DOES most definitely pig on his peanuts……….and many other snacks as well. Yes, Aaron! It’s very good that you didn’t pig on your peanuts! It was funny to adopt his phrasing and I had to smile, even as he enthusiastically continued to look in his plastic bag that was still heavy with his treasures. Gary had come home early and Aaron had stopped to show him one particular find of his. Out of his bag he pulled a screwdriver as he told me that Brandy and Barb had taken him and Rosie with them to run some errands. “Mom, we went to Ace Hardware. That’s a dumb store!” Aaron thinks it’s a dumb store because it’s full of things that are of little interest to him………although he does enjoy looking at all the unusual varieties of toilets. What can I say? Anyway, Aaron told me, “Mom, I found this screwdriver outside on the sidewalk.” I looked at it and could tell it wasn’t new as I worried that he may have snuck a new one in his pocket from the store shelf. He went on. “Dad said that you could have the screwdriver and you could put it on a high kitchen shelf. Do you have a high kitchen shelf?” I knew the reason that Gary suggested a high kitchen shelf. A high shelf would discourage Aaron from putting the screwdriver in his pocket again and using it for some unwelcome experimenting. He hardly paused before he reached into his bag again. “Mom, we went to another store and look what Brandy bought me!” He pulled out a full can of mixed nuts, which are not normal nuts. Aaron loves these nuts, as demonstrated later when he told us about the nuts with wrappers (skins) and the wrinkled nuts (pecans). I knew he would enjoy this special treat over the holiday. But he wasn’t through. “And Mom, Brandy bought something for me to give to you. Do you like Gummy Bears?” He handed me a bag of colorful Gummy Bears even as I assured him that I liked Gummy Bears……….knowing that they aren’t my favorite, as Aaron says, but relishing the fact that Aaron wanted to get me a special treat. The screwdriver was nice, but the Gummy Bears were very special. They were more a symbol from Aaron’s heart of something personal for Mom…….Gummy Bears! From his pocket he pulled some money that Brandy had said he could have……….money that he found in her van. I did check later with Brandy to confirm that story. What an exciting day Aaron had! He was showing it, too, in his happy voice and his animated demeanor. But there was one more thing. Oh brother! We have had so many rocks in Aaron’s room, collecting dust on top of his dresser or bookcase, or ending up under his bed. I’ve been trying to keep his room decluttered with all these finds of his. But Aaron had found another special rock, different from any others. They all are. And then it came to me! He thought that this was a grand idea, so I left my scrubbing to go outside with him. He carried the rock, not sure that he could trust me yet to not toss it away. 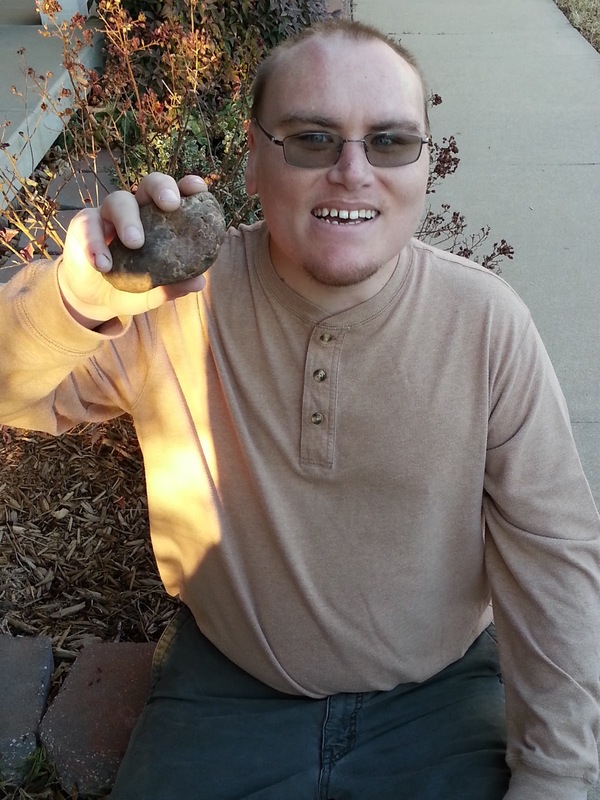 We found a place to situate the rock, but first I asked Aaron if I could take a picture of him with his special rock. He was happy to do so, and he held the rock up joyfully as I snapped a picture. You can see the delight on his face and the joy of this simple find………….a rock. And I realized that once again, Aaron has given me a moment to pause and think of life’s simple pleasures that are too often overlooked. Especially during this season of thanksgiving, I hope that I will realize that life is about more than sitting down at a table full of food to “pig on!” I also need to slow down and to notice the mundane and the routine………..and to thank God for each one. 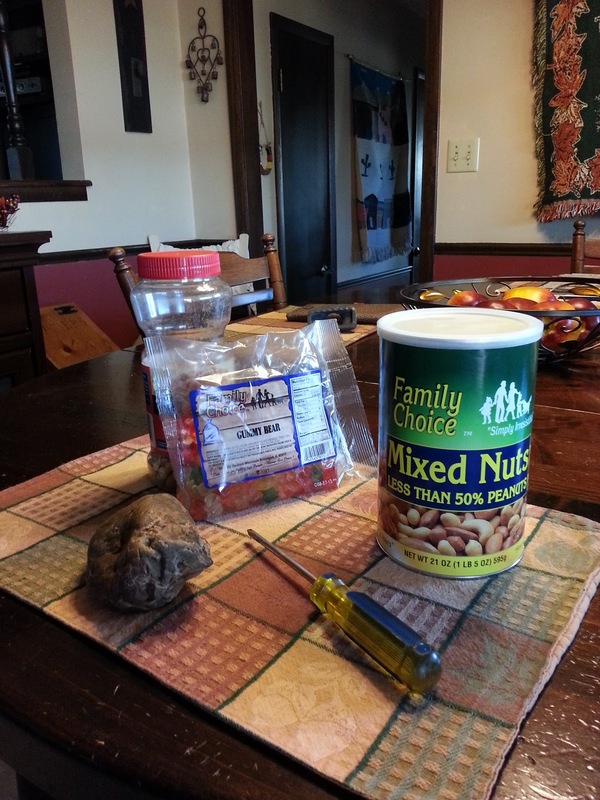 Each normal nut and each wrapped nut and each wrinkled nut………….each screwdriver…………each bag of Gummy Bears………….and each rock. God has put them all in my life for a reason – a very special reason. Just like he’s put Aaron in my life for a reason. Author hesaidwhatksPosted on November 22, 2012 February 28, 2016 Categories Adult Autism, Asperger's SyndromeLeave a comment on PIG ON! Aaron sure was in a great mood this morning. He’s excited about Thanksgiving, and has been in his usual countdown mode, reminding us about how many days it is until the big turkey day! He’s excited about having Andrea and Andrew home for a visit, and about getting to meet Andrea’s new dog, Darcy. I heard Aaron in the shower while I was still getting ready, and without having to be told. That’s unusual! I wondered if the mirror in his bathroom would be steamed over, knowing that it probably would be. He refuses to turn the exhaust fan on because he’s always had a fear of those fans from the time that he was a young child. 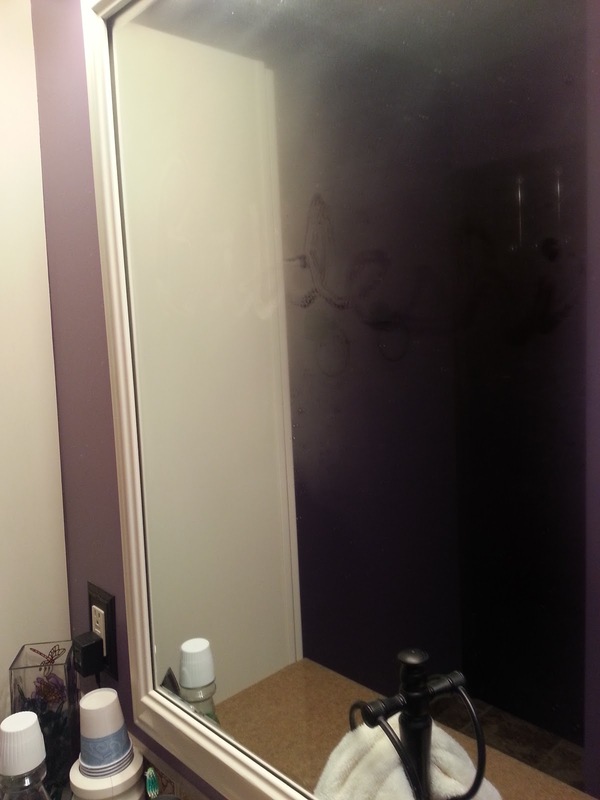 Plus he loves to sometimes write in the steam that’s on the mirror, and then to see those words reappear every time the mirror steams over…….which is every time that Aaron takes a shower! He usually writes something like “Aaron is cool.” He thinks that this is funny and doesn’t mind at all that I fuss at him about writing on the mirror. The other day he said, “Mom, the bathroom window gets fuzzy when I shower. I wrote ‘battleship’ on it!” So sure enough, the next time I was able to go in the bathroom right after he showered to see the still-fuzzy mirror, there was the word ‘battleship’ written on the fuzzy mirror. Why battleship? I have no idea. Sometime I may ask, but that morning I didn’t have time for what I knew would be a lengthy answer and then a run-down of that movie………..the one that I still haven’t quite recovered from. As I met Aaron in the hall after his shower this morning, he said, “Mom, it’s only two more days until Thanksgiving! Today is the 20th and Thanksgiving is the 22nd!” I don’t really need calendars as long as I have Aaron around! Aaron wondered if we could leave early and stop by Dillons for some peanuts, so I hurried and got ready. Soon we headed down to Dillons on our way to meet his group, where he bought a flavored water and a jar of peanuts……….after trying to pick up the largest container of peanuts that he could find and having that choice vetoed by mom. There is no hurrying with Aaron, and I was trying hard not to be late to meet his Paradigm group. Aaron plunders along very slowly, and before I knew it he was way behind me…………cradling his drink and his peanuts in his arms, and saying hello to nearly everyone who came his way. This is a new behavior of his, this greeting he gives to people that he passes. Or sometimes if he thinks he’s in the way, he’ll say “I’m sorry” over and over again to various people in the aisles. I smile even as I tell him to hurry or tell him that he doesn’t have to apologize for merely passing people in the aisles. Finally we were in the car, heading to his group meeting place, with Aaron continuing to talk. “Mom, is that legend of the weeping willow tree true? You know, the legend that says the tree looks like it’s crying because it’s all bent over.” We talked about the weeping willow tree legend while we listened to a song……..a song which suddenly captured Aaron’s attention. So I told him that this was a group that had two girls. For some reason, he could not figure this fact out. I was trying to figure this out and to explain that girls sing lots of different songs, when we pulled up to the car that was driven by Cody. Aaron always opens his window when we drive up, and Cody opens his window………..and they have a little conversation before Aaron leaves our van and joins the group. This morning Aaron said, “Cody! Mom was listening to a song that had girls singing in it. I thought they only sang in love group songs!” Cody laughed as Aaron continued to talk about what songs girls sing. Aaron never asks Cody how he is doing but instead launches right in to whatever is on his mind, or whatever he and I have been discussing. I wonder if he continued to talk about girl songs as he and Cody drove away? I think I’ll go clean the bathroom mirror now………or maybe I’ll leave it so that when Andrea and Andrew see the fuzzy mirror after their showers, they’ll smile at the sight of Aaron’s writing on the mirror. Some things never change, especially with Aaron. I guess that’s why he was surprised that girls would sing something other than love group songs. Girls are so confusing! I’m trying to think of how to describe our evening yesterday with Aaron. Was it…..interesting……entertaining…….frustrating…….funny…….or all of the above? I would have to say it was all of the above, certainly – and that using the word “frustrating” for some of the evening is actually putting it mildly. He came home in a very happy, chatty mood – anxious to talk to me about his day. He hadn’t been very happy that morning so I wondered how his day had progressed, and was relieved to hear that he had gone to the mall and seemed to enjoy it. “What kind did you get?” I asked him. He replied, “The normal kind.” I supposed that I was expected to know what the normal kind is………..and I later heard him say he had eaten peanuts, so now this new information was locked away in my brain. Normal nuts are peanuts. I smiled at his description. Yes, I guess you could say that your clock is new and improved, Aaron. It certainly is bigger and nicer than your old clock……….and I guess that qualifies for being new and improved. I felt like we were filming a commercial! It wasn’t long before Aaron asked if he could have his keyboard. We remove it every night in order to prevent conflict the next morning about getting off whatever game he is playing. I took a breath and calmly told him that he could not have his keyboard because that morning he had been grouchy and had refused to take a shower. No shower – no keyboard. He was calm as he continued to ask me about it, hoping that either he had heard me wrong or that I would change my mind. Soon, though, reality set in………especially when Gary got home and confirmed my decision. Things quickly went downhill from there, with Aaron becoming more and more angry. He would come downstairs to plead his case, and then stomp back upstairs to try to watch a video. And naturally, on the worst night ever, his DVD kept freezing. Gary worked on it and couldn’t fix it, which certainly did not help Aaron’s mood. All of this misfortune was our fault. Aaron wanted this and wanted that………we were awful parents…………he had the most dreadful life in the world……….we didn’t care……..etc., etc., and etc. Gary and I were firm but never raised our voices. Finally, after Aaron had followed me up the stairs and continued to talk angrily, he went in defeat to his room and once again turned on his second-choice DVD. But amazingly enough, I then heard him say, “I’m sorry!” I wondered if I had heard correctly, but soon there it was again, “I’m coming! I’m sorry!” Gary had come upstairs to check on things and was as surprised as I was. “Did he just say he was sorry? !” Gary asked. “What happened?” And I had to say that I didn’t know. Just all of a sudden, Aaron was sorry……….and we were cautiously optimistic that the worst of his angry outburst was over. He thumped happily down the stairs as I shuffled our Skip-Bo cards, and he proceeded to get his Chex Mix snack and his bowl in which he puts the little Chex Mix Melba toast pieces that he refuses to eat…….plus his paper towels and his regular towel that he carries around. I was breathing easier, more convinced now that he was really over his defiance. No, Aaron, you would make yourself in trouble………….which you do quite well. No, Aaron, you cannot have a sword. They have a sword section? And I thought how sweet it is that he associates hugs with Mom, especially after the way our evening had just gone. He’s still so innocent in many ways……….still so much like a little boy. He’s right about this, but it was very surprising to hear him say it. He has the typical autistic traits of being impulsive……….of not being able to control his outbursts and his rages………of being unaware of social cues, and do’s and don’ts that we take for granted…………and then later being sorry – maybe. It’s both sad and encouraging to hear him voice his thoughts and his struggles. We talked about it as we played our final game of Skip-Bo before bed, and I was thankful for his new calmness and hoping that some of what we talked about would take root and show up in more mature behavior. This morning he was very happy, very obedient, and very clean after his nice shower. After awhile, I thought it was very quiet. 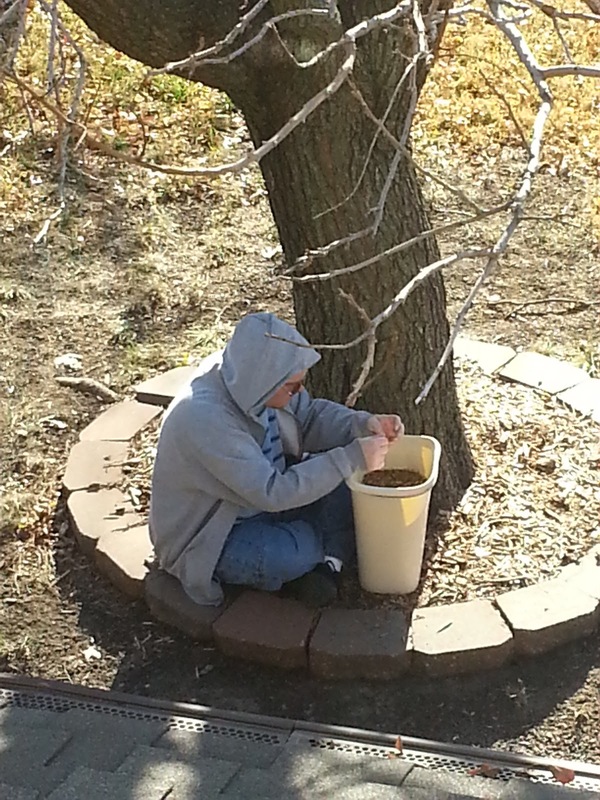 I looked out the window and saw him sitting under the tree, playing in the mulch. This is his way to relax and to process…………to wind down and think his thoughts. There he sat, in what he calls his “silver” jacket……..content and relaxed. Isn’t this just like the old nature and the new nature that Paul talked about? Sometimes the old crops up when we least expect it or when we’re not being careful. But God is patient with us……….and so we try to be patient with Aaron. We never know what to expect from one day to the next, sometimes one hour to the next. But he’s our boy and we love him. I think I’ll see if he’ll let me hug him today when he comes home. Aaron loves not only the act of eating, but he loves to talk about food……..what he ate, what he will eat, what he wants to eat, how much he did eat, how much he would like to eat………you get the idea. Nearly every day when he returns from his day group, he’ll eventually give me a run-down of his food consumption for that day. I like to know so I can figure out if he ate at least one healthy item……….or to redirect him in making wiser choices……….perhaps to see if he wants to eat supper with Gary and me…………or to be forewarned of what I might expect later concerning various stomach issues (if you know what I mean). He came home one day and said, “Mom! We went to Target and I was in the super part! That Combo Pizza Meal was $2.19 but then it became $7.24!” Uh-huh. I never did get an adequate answer about the price jump, but I knew that either he added more food or he spent his money on something else there. Who can tell? Then there was the time that he informed me, “Mom! I got a #10 menu item for lunch. You know what came with that menu?! A LOT of food! !” Which of course made Aaron very happy. He continued, “Mom, what are Tater Tots? Are they potatoes? And there were cheese sticks! They have cheese inside!” Really, Aaron? What a surprise! He doesn’t get my humor and just continues with his rundown of his meal, oblivious to my sarcasm, which makes me laugh and then makes him think that Mom is enjoying this meal recitation…………and around and around we go. He has no idea how entertaining he is, really. One day he called me from his day group. When I asked him how he was doing, he answered, “Fine I’m full.” No pause…..no breath……just all together – “Fine I’m full.” This could probably be said by him nearly every day of his life. The day that he said to me, “I’m full! Can you imagine that is true?” – was one of those days that I had to almost literally bite my tongue from saying what I so wanted to say. But again, sarcasm is wasted on Aaron so I decided to just keep my thoughts to myself. Aaron also loves, loves, loves to feed our Great Dane. And Jackson loves, loves, loves to eat anything (nearly) that Aaron gives him. Aaron will purposely drop food on the floor during dinner in the hopes that Jackson will come in after we eat and find it. We quit buying any rawhide bones because every time we turned around, Jacks would have a bone hanging out of his mouth, courtesy of Aaron. And after Aaron eats, he likes to go up to Jackson and blow in his face. We always tell Aaron to stop doing that, and one day he asked, “Don’t you want him to know our food?” Oh good grief, Aaron! It wouldn’t if YOU didn’t put it in your mouth, Aaron! He likes fruits and veggies, so I try to encourage him to snack on those as well as eat them at his meals. One day I was heating him up some leftovers for lunch and I told him that we had some spinach from supper a few days earlier. I asked him if he wanted me to heat it for him. He’s picky about his food touching, though, so he said, “Yes, but put it in a bowl – not beside my other stuff.” I did that, knowing that his food placement is as important to him as his food choices……….and also as important as the multiple number of forks and spoons and at least one knife that he always brings to the table for each meal. Some issues are just not worth fighting. As he sat there that day and ate his spinach, his always curious mind was thinking about how spinach grows…….so he asked me about that. “Does it grow on the ground? Isn’t that strange that it’s from the ground?” I reminded him that all the plants that grow are from the ground, but he quickly corrected me. That boy keeps me on my toes! Or should I say that he keeps me grounded? I was talking to my sister, Kathryn, last night. She wanted to know if Aaron got his clock that he wanted for his birthday. I realized that I had perhaps left some of you hanging on that issue, so I am happy to say that yes, Aaron got a clock for his birthday. It’s bigger than his old clock that he broke, and he won’t be carrying it around. I looked and looked, and couldn’t find one like his old one. He likes this new one, though. It’s just like the one that Gary got me and that I keep on top of our refrigerator. Maybe I’ll keep looking for a smaller one that has the time and temperature……..one that he can carry around with him in order to always know not only the time, but the ever important temperature………..indoor AND outdoor! These details are important to Aaron! His new one shows the humidity. Aaron has asked me several times to explain the humidity as he informs me that the humidity is high. No matter what I say, he seems to need more explaining………..and why on earth he doesn’t google these things is a mystery to me. I wish I had a dollar for every time I tell Aaron to google something! Kathryn also asked about how Aaron handles the recent time change. I thought I’d leave you with his comment to Cody, who picks him up for Paradigm. Gary and I had been over to Pittsburg to see Andrew on the Saturday that the time changed. I had told Aaron that on that night, after we got home and before we went to bed, we would change our clocks. This is very interesting and important to Aaron. 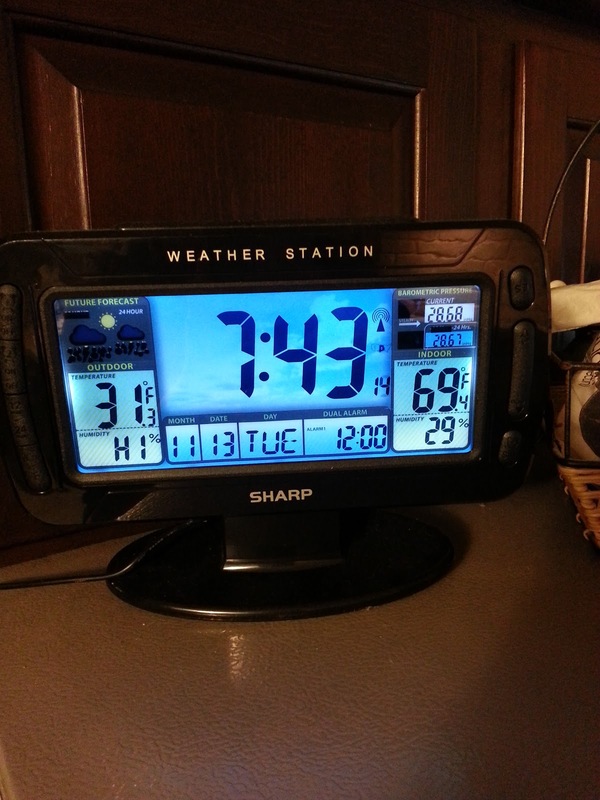 I have to stand in his room with my cell phone ready as he punches his digital clocks and gets the time just right. Only Aaron. It sure felt good to laugh on that Monday morning about our backward time.